It is amazing to think that Alpha Rev, the mild-mannered and down home band from Texas is currently rocking the same record label Queen used to not so very long ago. 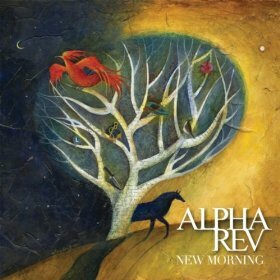 Alpha Rev, pulled together from Greek and Latin, is a loose variation of “the beginning of something new.” Their album New Morning, which is their major label debut, is exactly that. There is something different about this folk rock album that makes it hard to turn off. Honestly it is not particularly happy, there are many memories of unhappy times laced through the music. “Phoenix Burn” is a catchy tune, the lyrics encouraging “letting it go when everything falls apart.” It is a display of something fresh that encourages renewal, such as a phoenix rising from the ashes. Alpha Rev is already exploding with potential, they have been all over VH1, the single “New Morning” is a viral video and they were also put on You Oughta Know – Artist on the Rise” as a band to keep an eye on. The music is simple and catchy, the band is extensive and instrumentals back the music gracefully. I think it is the simplistic elements that make the album so likable. A basic beat, harmonious melody and relatable lyrics make Alpha Rev the next big thing. The buzz is right, keep an eye out for these guys because they are coming fast.